New York, New York- Friday- Day One « How Do You Measure 525600 Minutes? I’m starting the day at Starbucks, which should be no surprise. Our first two days were great– beautiful weather with a brief downpour around midnight last night. Friday we flew in to New York from Chicago, on time, which is a feat in itself. I could probably go on a rant about the crazy people that sat in front of me on the plane… strangers who basically decided to share their whole life stories on the flight. I could tell right away they weren’t together… the man constantly made eye contact with the woman and acted interested in her ramblings. If they were together, this would have never happened. Coincidentally, they both brought pungent food to eat on the plane. The woman was constantly waving cubes of cheese around in the air as she talked, while he sipped some strange smelling soup and devoured an extremely large sandwich. That was my in-flight entertainment. Michael and I decided it didn’t matter where we stayed this trip, so we had reservations at the Hotel St. James. No frills– oh wait, they do have very slow, free Wi-Fi and extra pillows. An old hotel in the heart of the theatre district, it could definitely use some remodeling. Okay, a LOT of remodeling. It is clean though. Plus, we have the novel experience of using actual metal keys for room access, as opposed to the universally adopted swipe cards. We grabbed a quick bite to eat and around a bit before our show, glad to be back in NYC after a two year break. 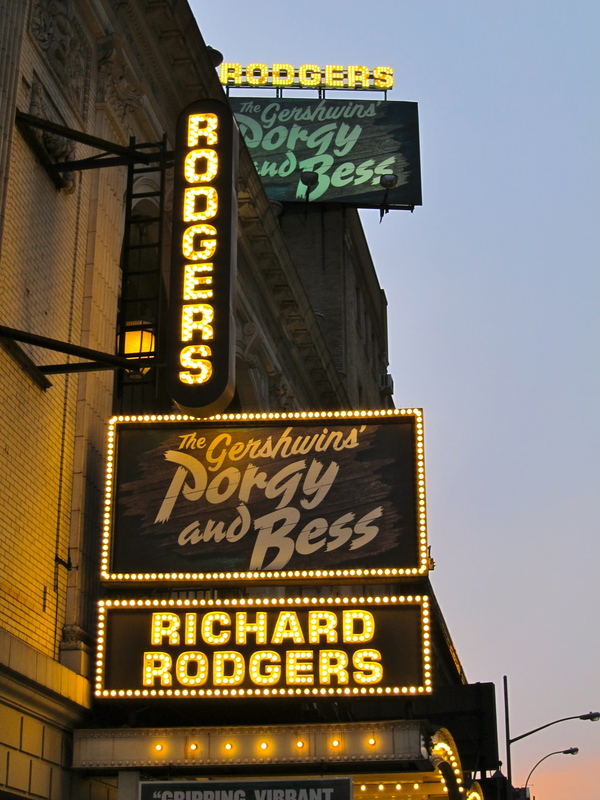 Porgy and Bess was our first show Friday night. It is a strong, beautiful production and by intermission I thought I’d found another old classic to love. Unfortunately, and maybe due to the new adaptation, I found the second act rather dull and contrived. Audra McDonald was wonderful as Bess and could easily be on her way to her fifth Tony Award. The overall singing was terrific but the plot just felt old, lazy and bored. Not the perfect first show for our trip but it was enjoyable for the most part. After the show, we picked up some snacks to take back to the room and crashed for the night. By jlinamen1229 in Uncategorized on March 25, 2012 .